My romance with shrimp began when, years ago, I looked up the etymology of scrumptious in some modern dictionary. Naturally, it turned out that the word’s origin is unknown (this happens every time I try to satisfy my curiosity in the area of my specialization). The usually sensible Century Dictionary suggests that scrumptious is an alternation of scrimptious, from scrimption, a funny noun going back to scrimp. The OED thinks so too. The semantic change from scrimptious to scrumptious, it explains, needn’t worry us, because adjectives occasionally change their meaning to the opposite. Compare the history of nice : from “ignorant” to “stupid,” to “minute and scrupulous,” to “dainty” and “delightful”. One can also cite the seriously ameliorated adjective pretty: from “tricky, cunning, wily” to “astute, sagacious, ingenious,” even “brave,” and finally to “good-looking.” But it took nice and pretty several hundred years to “turn around” (and there is the evidence of cognates), while scrumptious is slang hardly predating the first quarter of the nineteenth century, and the intermediate stages in its history, including dialectal use (“mean, stingy, close-fisted; fastidious, hard to please; stylish, handsome”), shed little light on the change. In a more general way, one can note that words sometimes combine opposite senses, especially across related languages (“hot” and “cold,” “high” and “low,” “beginning” and “end,” and so forth). There is even a learned term for it (enantiosemy: a recent Greek compound modeled on German Gegensinn). Terms and parallels notwithstanding, every case needs an explanation. Shrimp turned up in English only in the late Middle period and meant “a dwarfish creature.” The verb shrimp “shrink” also exists. The closeness of shrimp and shrink is apparent. Shrink derives from Old Engl. scrincan “wither; cower, huddle.” The senses “become reduced in size or extent; retreat, recoil” were attested or developed later. The crustacean that interests us seems to have had a different name, but, when we begin to look for the linguistic environment of shrimp, we invariably find references to shriveling and emaciation. Scandinavian dialects are especially rich in such words — for example, Norwegian skramp “lean man or horse” and skrumpa “big lean cow,” along with Danish skrimpe ~ skrampel “thin cow” (also said about other cattle). Dutch cognates usually mean “wrinkle” (arguably, a small thing), whereas German schrumpfen means “shrivel.” At one time, English also had the verb shrump “shrug; shrink.” As though to remind us of the scrimptious ~ scrumptious alternation, we learn that German schrumpfen replaced the earlier form schrimpfen and that Norwegian skrumpe, an exact counterparts of German schrumpfen, must also have ousted the verb skrimpa. But the German-Scandinavian leapfrog (should we say leap-shrimp?) is old and has an easy explanation. There we deal with a verbal root of the same type as Engl. sink—sank—sunk. If the new infinitive to sunk emerged in English, we would have stated that the vowel of the past participle crept illegitimately into the infinitive. It would still be a strange development, but its source would be evident. Likewise, some of us feel indignant that snuck substituted for sneaked in the speech of millions of Americans, but the causes of the change are not baffling, while the indignation is completely wasted (there once was a post in this blog titled “Sneak, Snuck, Snack”). By contrast, the change of scrimptious to scrumptious had no environment to justify the substitution, for the analogs of shrimpfen ~ shrumphen did not exist in nineteenth-century English. We discover that scr– is a common modification of cr– (which does not come as a surprise, for s– constantly attaches itself to the roots of Indo-European languages, and there is a learned term for this phenomenon too, as for everything else, namely s-mobile “movable s”) and that various scr- ~ skr- words may perhaps be related to shrimp, but each of those words has its own history, which is sometimes far from clear. Tracing them to the same root produces a grand and imposing picture that may bear scrutiny only when an etymologist provides a bird’s-eye view of the whole. More about this subject will be said in the forthcoming post on shrew. The phrase “obscurely related,” often used in such situations, should, in my opinion, be avoided: it safeguards the researcher from criticism but means very little. The same holds for “closely related.” The question always is how obscurely and how closely. 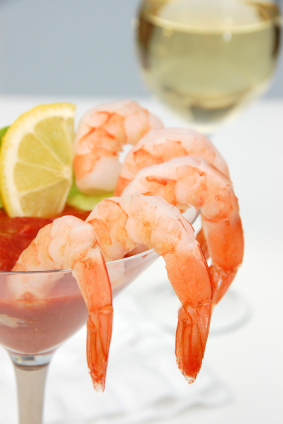 There is a troubling detail even in the history of shrimp, otherwise a transparent word. No doubt, the noun shrimp belongs with the verb shrimp, almost certainly with the verb shrink, with their doublets having no s– (for example, crimp), with Norwegian dialectal skramp and skrumpe, German schrumpfen, and quite a few others. When shrimp surfaced in English, it probably meant “diminutive creature.” The slight difference in the dates of our first records does not make it clear whether there was enough time for the transfer of the name from “tiny marine creature” to “puny human being.” Also, no Germanic language associates the shrimp with its size. German Garnele, Norwegian rekje, and its close cognates in Swedish, Danish, and Icelandic have nothing to do with dwarfs; their etymons should probably be sought among foreign words. The same holds for Romance: French krevette and Spanish camaron ~ Italian gamberetto (possibly, very old borrowings), let alone Spanish quisquilla “trifle; shrimp” (Latin quisquillae, plural, means “rubbish”). If such is the case, it remains unclear in what circumstances the name was applied to the crustacean. Along the way, we have encountered lean cows, horses, and people, but not a single inhabitant of the sea. When we call someone small and unimportant a shrimp, it sounds like a metaphor (and perhaps in today’s speech the way is indeed from the animal to a human being), but, viewed historically, the name coined to designate dwarfs seems to have been transferred to the animal in an undocumented process. Be that as it may, Spanish quisquilla shows that shrimp and trifles are inseparable in our mind. Poor shrimp! Though not a fish name, it behaves like them and in Standard English has no s in the plural. Or do we associate shrimp with collective nouns like cattle? Where does “scrump” (to steal apples from an orchard) fit in? Thanks for the catch. Occasionally they slip through. I’ll go fix that now. Scampi is from Italian and means prawn. Does that make shrimp scampi a tautological compound? Etymonline writes that scampi comes from a PIE root meaning ‘to bend.’ Perhaps the German and Norwegian versions of ‘shrimp’ also received their names from the shape rather than their size of the creature.